Ever since the first mobile devices first emerged, many asked if CAD applications could eventually run on them. This eBook provides updated answers to that question. 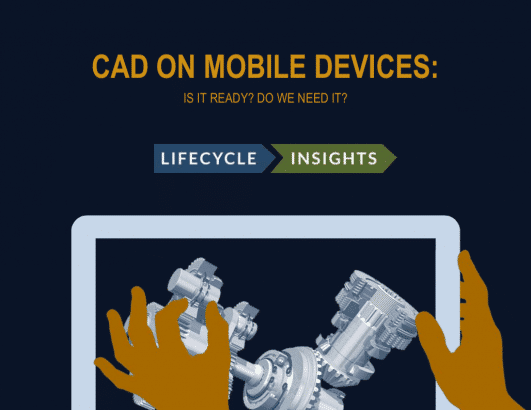 CAD on Mobile Devices: Is It Ready? Do We Need It? Why Do Engineers Need CAD on Mobile Devices? Can CAD Work on Mobile Devices? In the last five years, mobile devices have become truly powerful. As we inevitably edge towards the possibility of running CAD on mobile devices, several questions arise. Do engineers really need CAD on mobile devices? How will CAD perform on such devices? How will the interaction change? This eBook provides to those questions and more. This eBook is most valuable for Engineering Managers and Directors considering mobile computing platforms for their engineers. In recent years, however, some engineering organizations have been experimenting with CAD on mobile devices in one particular form. Findings from Lifecycle Insight’s 2013 3D Collaboration and Interoperability Study showed that 13% of respondents had been using smartphones to view engineering documentation. Furthermore, Lifecycle Insight’s 2014 Model-Based Enterprise Study showed that 20% of respondents had used mobile apps on tablets to view drawings and 3D models. These have been initial steps towards fully leveraging mobile devices in product development and show that these applications are feasible and valid. While these engineering organizations have been experimenting with viewing and interrogating engineering models and documents, the power of mobile devices has been steadily increasing. Their processors have become more powerful. Their disk space and memory have expanded. Their graphics processing has grown. It’s enough to ask that question again, albeit more seriously this time: Is full 3D CAD design on mobile devices ready? Answering that question is the purpose of this eBook. Here, you will find insight into how CAD on mobile devices can be applied in development. You will find details on how not only compute power, but also new interactions on mobile devices, affect performance and usability. Finally, you’ll gain insight on how CAD running on mobile devices affects organizational and personal productivity. So dig in. It’s time we considered this question seriously.